New super low pricing on high quality bulk coax like RG8X mini 8 Cb radio coax cable for truck or car antenna and RG213U military spec base coax, higher quality than the RG8U and at super low wholesale pricing. New connector options: soldered or not soldered. Also New mini 8 Cb coax with screw on PL259 connectors in single or co-phased. GI Joe's Radio Electronics. High quality RG8X Cb coax cables for Cb radios, amateur radios, marine radios and more. Rg 8 X, 50 ohm Cb coax. Choose gray or clear coat mobile Cb coaxial cable with soldered on un-soldered PL259 connectors. Also called Mini 8 Cb coax cable. Sightly better quality than RG59 coax. 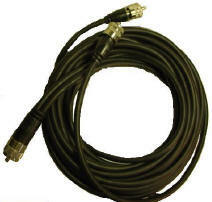 *High quality coax for Cb, marine radios and more. *Choose connector options, length and color after clicking "add to cart". *Choose length and connector options after clicking "add to cart". *Choose length 9', 12' or 18' after clicking "add to cart". High quality military spec single cb coax. EZ Cb radio coax has a stranded copper center conductor and solid copper shield with a tin coating to help prevent corrosion. *One end is a slodered PL259 the other has a screw on PL259. This is for threading coax thru mirrors and other tight places. High quality military spec co-phased cb coax. EZ Cb radio coax has a stranded copper center conductor and solid copper shield with a tin coating to help prevent corrosion. *One end is a slodered PL259 the other 2 ends have screw on PL259's. This is for threading coax thru mirrors and other tight places. *75 ohms each side = 37.5 ohms total impeadance.